After more than four years lying idle at Rosneath, the former CalMac car ferry JUNO has been sold for scrap. 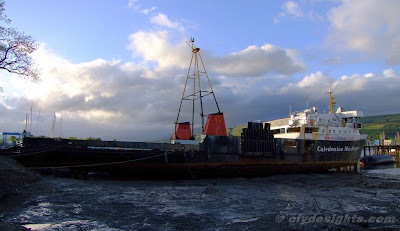 At high water on Wednesday 18th May, she was moved from the face of the pier to the south side, and berthed at the landward end where dredging had been carried out to allow her to move close inshore. Over the next few weeks, demolition of the ship will be undertaken, and as much material as possible sent for recycling.